The Bobcat Chronicle: National Student Athlete Day! 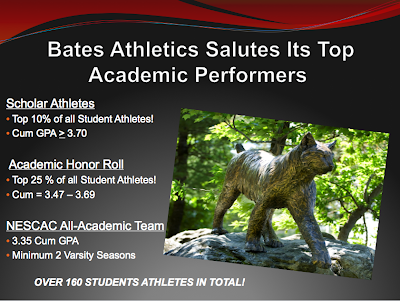 In recognition of National Student-Athlete Day, the Bates College Department of Athletics salutes the academic accomplishments of some of Bates' 600-plus varsity athletes. Director of Athletics Kevin McHugh this week is distributing certificates to the top 25 percent of this year's student-athletes, in terms of their cumulative grade point average. 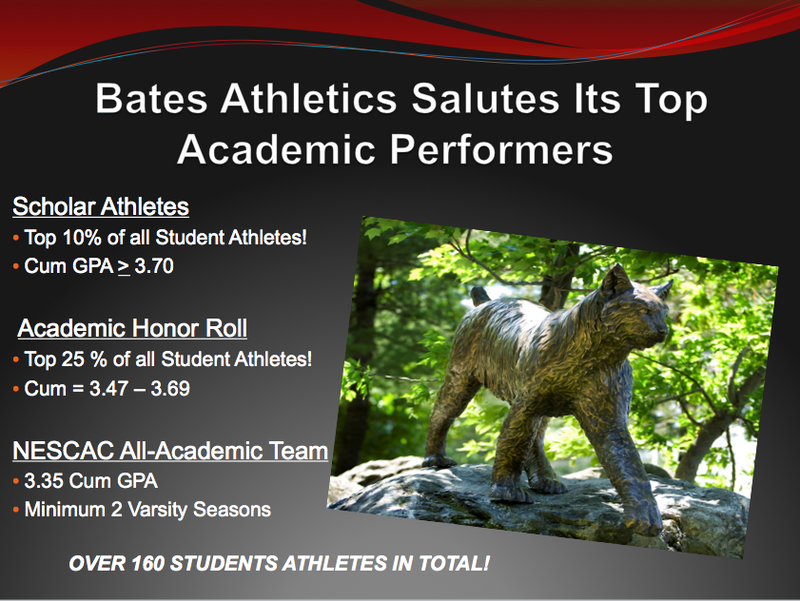 Those honored as "Scholar-Athletes" represent the top 10% of Bates varsity athletes in terms of their cumulative GPA through the Fall 2010 semester. This year, that translates to 60 student-athletes carrying a 3.70 GPA or better (up from 3.68 last year, the inaugural year of this program). Those honored for maintaining a GPA in the top 25% of all varsity athletes are named to the "Academic Honor Roll," which this year translates to 87 student-athletes whose GPA is between 3.47 and 3.69 (up from 3.46 to 3.67 in 2010). Travis Jones, Cody Jenkins, Sammy Schadt, Nick Karlson, Mollie Corcoran, Emily Depew, Abigail Hanson, Caroline Hinkle, Jessica Howard, Leah Burke, Tara Dugan, Charlotte Green, Gabrielle Sergi, Emily White, Catherine Zingale, Blaine Brown, and Carole Lupi!